I’ve decided to take a little “me” time! Today is a lovely, sunny day – breezes blowing, sun shining, moderate temperatures and it’s also SATURDAY! What does this lovely day find me doing first thing? I decided that TODAY is the day that I re-teach myself how to knit CABLE stitches! I should insert here that I haven’t knit cable stitches since I first taught myself when I was around 12 yrs. old. Have you ever had a time like that where you just decided NOW is the time I’m going to try this thing, attempt this new (or old) project? You might have attempted it many times before and failed, but RIGHT NOW you are going to give it another great effort and (perhaps) conquer it…that was this morning! Now that I’ve convinced myself that, indeed, I CAN knit cable (if I want to); I can put that to rest. Yes, I did accomplish three various cable patterns; now that I fully remember that it’s a real pain in the rear, I’m going to let that remain in my “I CAN do that!” file and get on with life. Guess it’s time for me to wrap this one up and actually GET DOING! I was feeling a little down about not actually writing here lately and felt like it was ‘time’ to get something on this blog. Hope you have a great day and stop for awhile to enjoy this gorgeous summer! In the very near future I plan to include various knitting stitch patterns for those who need a little nudge in the area of what to knit (thanks, Momma, for your help providing me with basic stitches!). I know when I first began all this, I really didn’t have a very big ‘repertoire’ of stitch patterns. 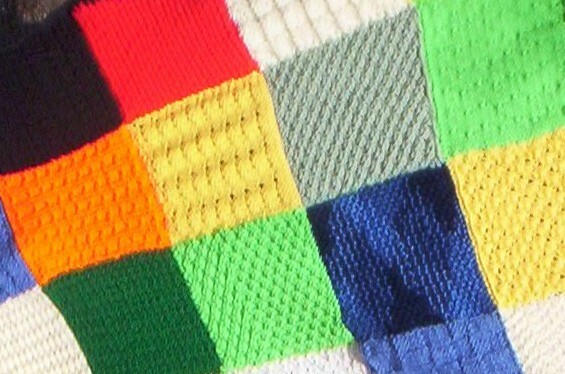 After reading various knitting books, on-line surfing, etc., I’ve put together a collection of simple stitches which make up into squares nicely. I’m no professional knitter, by any means! I was looking for using basic techniques like knitting, purling, yarn-overs, and maybe a few knit 2 togethers, or knit in front and back of this stitch, so please don’t be intimidated by this project…I’m not looking for really fancy knitting (or crochet), just good old honest-to-goodness work from your hands and hearts! I want to thank any and all of you in advance who are willing to help me in this area. Your work is a blessing to others and your help is a blessing to me, personally. Thank you and may you be blessed abundantly of the Lord. I’ve asked a dear friend’s son if he would be willing to help me set up another blog on wordpress especially for this project, so that anyone interested could go there for instructions and an address for mailing completed squares. As soon as that site is up and running, I’ll post it here for anyone willing to help out. I’m just so grateful that the Lord can use my efforts to help others around the globe – who would have thought it possible!? On another note, my middle son had his graduation party yesterday at church and it turned out very nice. He’s the one who said: “I’m not sure I want a party”; that would also be the person who said, when it was all over: “Thanks, Mom!” We still have his actual graduation coming up June 16th, but for now it’s a little reprieve on all the planning, buying, cooking, etc. He just purchased his first car, also, on Saturday. He’s now the proud owner of a 1994 Chevy Lumina minivan! It isn’t exactly what most people would think of for an 18 yr old. young man…(it’s turquoise!) but it’s in good shape and will (hopefully) get him around for quite awhile to come (it has 193,000 miles on it!!!). NOW we just have to get the last part of his Driver’s Ed. Level 1 license done so he can actually DRIVE IT by himself!!! That’s our next step! He only has something like 25 minutes daytime driving and less than 3 hours nighttime driving to finish before he goes for the Level 2 Drivers Test with the Secretary of State. (For those of you who don’t live in Michigan, we have pretty stringent driving rules for young drivers…I’m glad for that!). Anyway, just had to share my excitement with you (and my fluffy-feather tummy…or butterflies, if that makes more sense!). Life continues to amaze and excite me! Thank you Lord, for this great project!